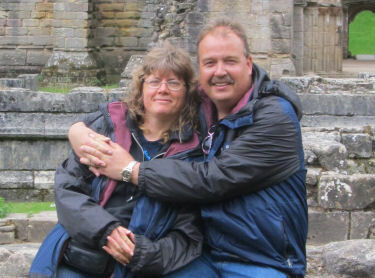 We are Richard & Liz, parents to 5 wonderful children. Our homeschooling adventure started in 2000 when our older two were 10 and 11 and in middle school. Our eldest two children, Michelle & Michael are now graduated & we are homeschooling the three younger ones 15, 11 and 8. When we first started homeschool we were very rigid because we had been used to “regular” school. Over the years we have relaxed & now work with each child’s talents to bring out the best for them. Having lived on farms in various states we are full-time RVers! Yes, life has changed but we love it. We live an active, adventurous life so for us school goes mostly year round. A 5 day school week just doesn’t work for these parents or their kids. (To keep our sanity four days works much better.) Not only that, with now living on an RV park, the kids want to play with the other kids that tend to start arriving towards the weekend. With a flexible schedule we get to enjoy field trips & much more. Originally from England we have now been in the USA for over 20 years. Liz, the main researcher of home school curriculum, utilizes ideas from all over the world. Richard is a great supporter & does most of the science experiments etc. with the children. We set up this website so that others can enjoy all Liz’s research without having to spend the time researching it for themselves. Daniel & Hannah are both “Special Needs” children in the fact that they both have some developmental delays. Although we do encourage them to work independently as they mature, they still need a lot of assistance, Hannah more than Daniel. For a time we did a lot of joint unit studies/lapbooks which are great BUT things got too chaotic in the “classroom” so are now back to individual work for each child. Teaching children of different ages and varying learning/behavior challenges is definitely wearing at times but we still would not swap our homeschooling lives for anything. As Liz researches she realizes however that it can be overwhelming with all the info out there plus one program never seems to fit all. Our aim is to just help you along the way & share what we have found works for us. On the personal side Richard is a part time paramedic with a local ambulance certified as both a Critical Care Paramedic and a Flight Paramedic. He is also the main person behind our web design and hosting business, more details of which can be found here. Liz is a SAHM who loves to think of something new to do in our homeschool. We are entrepreneurs in the truest sense of the word hence the business name Cornish Heritage Ventures. We always have our fingers in a few “pies”, love working for ourselves & believe in providing the best customer service ever. Our newest acquisition is ABC Photo Art, a business still in its infancy but one that we believe will grow and develop over the next few years. P.S. You may be wondering how and why we came to start homeschooling. We’ll be honest & say that many years ago we thought homeschoolers a little strange. We had been brought up in a culture where almost everyone left the home to go to school. Liz was given a private education in all girls’ schools and Richard went to public school. It was completely natural for us to send Michelle and Michael to public school when the time came. (Private school was not an option due to the expense!) We moved to the USA when Michael was 7 and Michelle was 8. You may think we all speak the same language but moving was a real culture shock! LOL! It was a hard adjustment for the kids also but more so for Michael. Michelle enjoyed being different but Michael felt very pressurized to conform. (The rest of us have maintained our British Accent but you would not know talking to Michael that he was not born here!) Michael really struggled in the Elementary grades but once he hit Middle School in September of 2000 he started to go down hill rapidly. His grades started slipping and Liz was spending her nights “fighting” him to do his homework. The reality was he could not sit still for 5 minutes let alone the 90 minutes required in school. By November we knew something had to change. We talked to both Michelle and Michael about the possibility of homeschooling. Michael was all for it, Michelle (who was thriving in public school) said she would give homeschooling 6 months. None of us have never looked back 🙂 If you read our personal story on our family blog you will read that homeschooling was not the “miracle cure” for Michael. He was a difficult student and in later years really put us through the mill. However Richard and I are convinced that we delayed the trouble by homeschooling him and were able to protect him from getting into far worse trouble than he did. Fast forward to now and Michael is a changed man and a dedicated husband and father to his wife and girls.